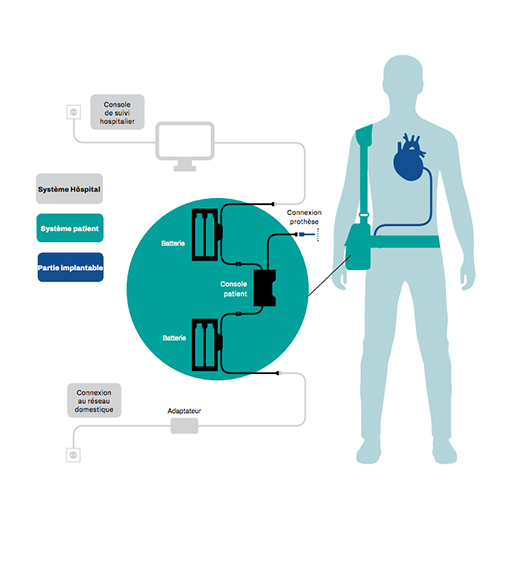 The CARMAT artificial heart is a medical device that aims to provide a long-term solution for patients suffering from end-stage heart failure, with no alternative treatment, due to the lack of suitable human organs. 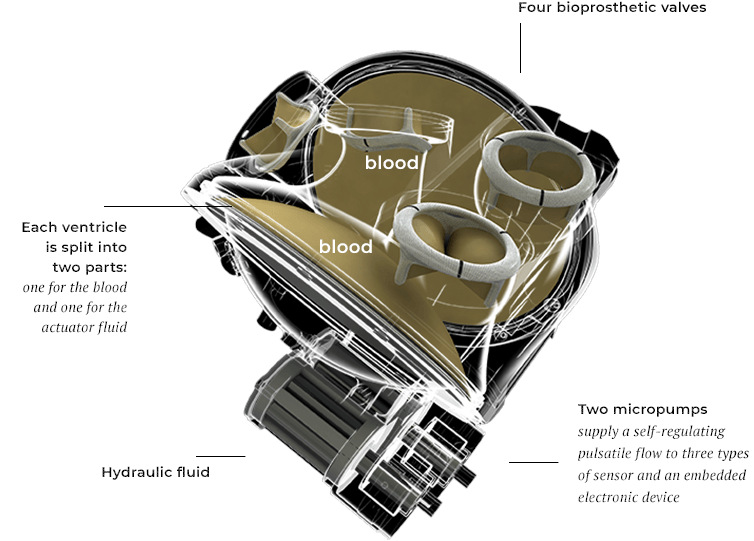 The only artificial heart with surfaces in contact with blood that are made of biocompatible materials with the potential to reduce thromboembolic risks. The pump unit hydraulic mimics the two parts of the heartbeat: diastole when the heart muscle relaxes and allows the chambers to fill with blood; systole when the muscle contracts and pumps blood into the arteries. 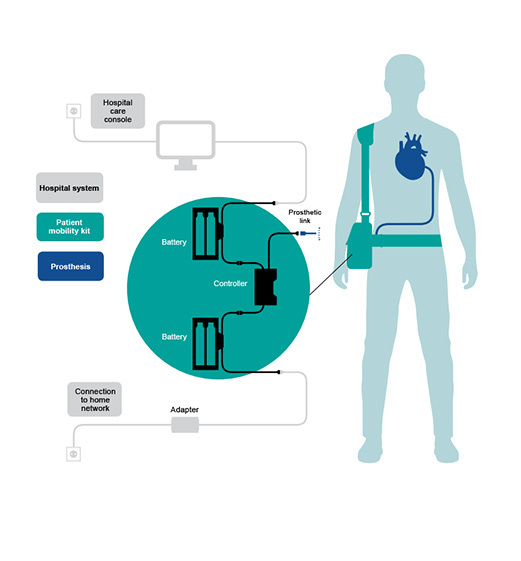 The first intelligent artificial heart to offer an immediate, automated response to the patient's physiological needs. The patient system provides the mobility and autonomy needed to lead a near-normal life. It weighs 3 kg and includes a controller and lithium-ion batteries providing an autonomy of about five hours. The medical team must use the hospital console to operate the prosthesis during implantation and track how the device is functioning. Carmat aims to successfully tackle the problem of heart failure, a major public health challenge and the leading cause of death worldwide. The goal is to offer a long-term solution to treat end-stage heart failure, a disease for which there are currently very few effective treatment options available, most of which rely on a heart transplant. A new “LEASE OF LIFE” for patients who receive an artificial heart. A LONG-TERM ALTERNATIVE for the more than 100,000(1) patients suffering from Class IV(2) end-stage heart failure who need a transplant every year. (1) Rose, Gelijns, Moskowitz, et al. Long-term use of a left ventricular assist device for end-stage heart failure. NEJM. 345:1435-43, 2001. / Rogers, Butler, Lansman, et al. Chronic Mechanical Circulatory Support for Inotrope-Dependent Heart Failure Patients Who Are Not Transplant Candidates: Results of the INTrEPID Trial . J Am Coll Cardiol. 50:741-47, 2007. / Hershberger, Nauman, Walker, et al. Care processes and clinical outcomes of continuous outpatient support with inotropes (COSI) in patients with refractory endstage heart failure. J Card Fail. 22:616-24, 2003. / Gorodeski, Chu, Reese, et al. Prognosis on chronic dobutamine or milrinone infusions for stage D heart failure.Circ Heart Fail. 2:320- 24, 2009.